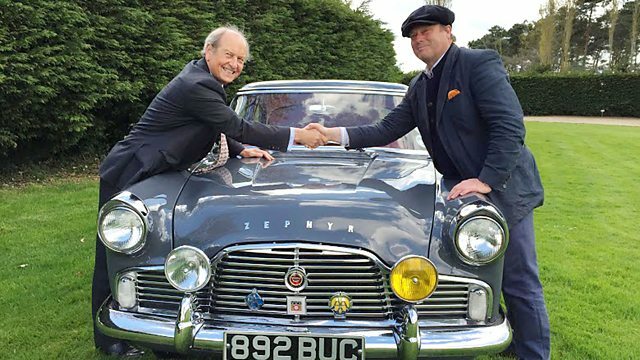 Charlie Ross and James Braxton set off from Shenton in Leicestershire and head to an auction in the village of Bourne End, Buckinghamshire. and Charlie Ross midway through their road trip. -We've got the sun on our backs, we are going to do well today. Charlie is as charming as ever. -I'd quite like to go away with that. -Would you come with me? And James is a patriotic soul. Well, I am very pleased with my Queen's shield. I think I can be a loyal citizen. a car made before seatbelts were legally required. -I think I put it into reverse. Our Road Trip pals started off with £200 each. with a kitty of £148.76 for the day ahead. with the two Doulton vases. He has a stuffed wallet of £433.50 to spend today. and finishing in the Surrey town of Cobham. which seems to have come to a rather premature end. Don't you worry, it'll be all right. Cheer up, Charlie, you can still catch up. in the very pretty Whitemoors Antiques and Crafts Centre. I think you need to loosen off that tie at some point. The black tie, the tie of mourning? -Tie of mourning, I think that can go. -I think that can go. -You have been here before, haven't you? -I have been here before. And it made a lot. Carry on. Shall I go this way? Blimey, what did Charlie have for breakfast? There are 40 different dealers here. -Aha! You look like the boss to me. -Lovely to meet you, Charlie. Portia. -That's a very racy name. Right. You've got work to do, Charlie. Didn't they make luggage well? An Edwardian piece of luggage. It's got its original brass studs on the bottom. There's quite a demand for vintage luggage these days. And it's got really rather a lovely patination. And what I like is when they've got original labels on them. I could see that making £40 or £50 at auction. the use of the rather attractive gentleman's valise. Yeah, I've seen something I quite like. -No, it is lovely. What chance have we got? Have we got a ch...? I mean, I'll tell you, I'll be perfectly honest. I think if it goes to auction, it will be estimated at £30 to £50. I think it might make 40 or 50 quid. It is a good thing. A bit forward, that. Just a minute. -I think I'll have to ring the tenant and see. -Charles, I've just spoken to the tenant. -Have you done better than 45? -She'd be happy to take 27.
and beat her down to 25. I'm going to say £27 is really generous. the gentleman's valise for £27. is he going to go all out or exercise some prudence? -Hello, nice to meet you. And your name is? What wonders can you spot in here then, James? -So this is your emporium, is it? So where did you gather all your goodies from? -From auctions, from houses, from people bringing stuff in. -This sort of leaps out at me here. -That is a very '50s look. The retro thing is in at the moment. I like the figurine. She is a very shapely lady, isn't she? that eggshell finish to the glaze, doesn't it? Where...? And the pattern is called Jamaica. -Just what we need, something exotic and warm, isn't it? I definitely need it. That would... She would be a lovely tonic. She'd lose your cold in a hurry, wouldn't she? and is proving to be very popular at auction. And very practical, you know. A couple of single stems. Get your gladiolas in there, your camellias, whatever. -With or without, it still stands good. -It stands good, doesn't it? I would definitely have that in my home. Now, what could you do on that, Rob? -..because I want you to win. It is in good order. It is bright, it has been looked after. It has been slightly treasured. I think that is very handsome. What about eight on that, Rob? -You know how these auctioneers work. Yeah, you know, they all start in ten, five and everything. -To give me a little bit. Ten. I am liking your start. Rob, put it there. A quick and efficient purchase from James. £10 for the 1950s West German vase. Charlie has journeyed east to the historic village of Kidworth. so needs to uncover a hidden gem somewhere. This large, family-owned antiques centre has over 60 dealers. Or even William IV rosewood over-mantle mirror. Now, you can see that the mirror is not in great condition. it's quite good having a mirror like that, to be perfectly honest. 160, 170 years old years old. And I could get away with putting a new mirror in there. ..I would buy it because it's a genuine antique. Let's go and see what we can do. Time to track down the lady in charge, the lovely Sally. -Turn right. It used to be a mirror. -Used to be a mirror. Well, it looks like it. Can you see? Can you hold that end? -Cos it says antique tarnished mirror. -It certainly is. Look at us in there. You can't really see us. -The fairest of them all. And I like old things. It's knackered here and there. -And I want to give a tenner for it. -It's missing lots of beats. -What do you think? Who is HH? It has got HH on it. -It's not Horrible Henry, is it? -No, it's not Horrible Henry. -mirror, would she still be Happy Henrietta? -What we can do, we can make a phone call. Tell her Charlie's desperate, would you? And a bit of a chancer. -I am smiling a little bit. she says that she is quite happy to come down to £15 for you. -I can't ask for more than that, can I, really? -I was being very cheeky at ten. Put it there. -May I give you one of...those? Charlie's second purchase is the 19th-century mirror for £15. James, meanwhile, has travelled 24 miles to the city of Leicester. James is sitting pretty with a large stack of cash. So far, he has spent a tenner. Come on, James, get spending. -Hello, James. My name is Mark. Hello, Mark. I'm after the elusive bargain. The elusive bargain. Well, let's see if we can find you something. -I am getting the lay of the land. Quite a crude tribal stool, this. but it's carved from the solid, from the trunk. They make great occasional tables. They're just the right height for sitting beside a sofa or something. And they have a look, don't they? Would it've been a solid trunk of wood here? And somebody has freed it. you release the figure from the object, be it marble, be it wood. And you chip away and you release it from its natural bindings. I noticed this when I walked in, Mark. -Yeah, naive charm, isn't it? So it's carved out of the solid. I think it would've been one piece, definitely. -You can't see any joins or anything. -And does this come from...? Probably...African origin, somewhere around there. What sort of money do you have on that, Mark? Um, I've got 55 on that one. -I'm going to carry on looking, Mark. After a good scratch around, James is ready to make a deal. Would it be too cheeky to say 25 on that? -Could you make it 30? -You've gone and got yourself a deal, Mark. Thank you, I'll take that. James is attracted to the exotic today. The tribal stool for £30 is his second item. have always loved tribal art. This is a rather fun thing. Anyway, I'm pleased with it. And I'm off with it. Thank you, bye-bye. He doesn't hang about much. Charlie has travelled south to the town of Northampton. and even the local football team have the nickname The Cobblers. not just in sport but also in British history. Charlie is meeting with author Phil Vasili. -Very well indeed, thank you. Welcome to Northampton Football Club. who played right here, at Northampton Town Football Club. Phil is the biographer of Walter's sensational story. we are in the engine room of the Northampton Town FC. We can see the pitch, we can see the stands. And where better to start? We've got this wonderful archive here. because Walter was very happy here, by all accounts. Walter was born in Folkestone, at the end of the 19th century. and married a local girl. along with his brother, to an orphanage and Bethnal Green. -When he went to the orphanage, they had a football team. And they played in a... They played competitive games. -round about this time as being particularly talented. -and he's got the ball at his feet. and he's one of the better players. In 1908, Walter was signed by amateur club Clapton FC. when he was signed by Tottenham Hotspur. Spurs, for him, wasn't a great source of happiness, was it? -It was wonderful that Spurs signed him. is unusual at the time. And Spurs have to be commended for that. However, Walter got a lot of abuse when he was playing. the abuse that Walter got. playful football because of the way he withstood the abuse. -did his talking as a footballer, with his feet. was thrilled to snap up the talented Walter. But soon, the dark clouds of war loomed, in 1914. Walter was one of the first to enlist in the British Army. his battalion went to France. in around the Festubert-Givenchy region. and I think I'm right in saying - was he recommended for an MC? white troops into battle in the Army. and commended for bringing back his party without injury. which he never actually received. He embodied a legal contradiction. according to the manual of military law. -They were giving a rubber stamp to breaking the law, really. was killed in action at the German spring offensive on the Somme. who achieved a great deal in his short life. -The road that leads into the stadium is called Walter Tull Way. We've got the memorial stone detailing his achievements. an extraordinary tale of a remarkable man. as a star on the football field and a hero on the battlefield. It's the end of a long day, so time for a bit of a rest. Nighty-night. Cor, it's absolutely tipping it down this morning. This weather, very good for the leather upper, I would say. You need a leather upper. A good brogue is always the best option. Anyway, here is a rundown of their shopping so far. and the 19th-century mirror, giving him a meagre £106.76 for today. He's swimming in money with £393.50 for the day ahead. James is in Northampton to have a go at spending some of his money. Although he's rich in profits, he's only spent £40 so far. -Hello, Sonia. Very nice to meet you. You're a very nice little haven amongst a... Foul out there today. -Well, I hope we've got something for you. to part with some cash. There's some nice things amongst here. I love this! This is very theatrical, isn't it? Great for a sort of baronial hall, isn't it? Baron Braxton has a certain ring to it. and could have been made for the Queen's Silver Jubilee. I like this. A modest woodcut. But what I like about this is it's very much in its contemporary frame. It has a good look. Does it have a date on it? It's evocative of a period, isn't it? 1920s. It's got a personal inscription on it. And it is a woodblock print. and book illustrations. Artists really loved it. I like that. It's got style. Another one on the list. The woodblock print has a ticket price of £10. Now, to find Sonia to talk money. These are my two items, Sonia. I love this shield. Isn't that fun? -Do you know much about that? It was something to do with Andy's family. He bought it because he liked it and it was his family's initials. Andy is the owner of the shield. -I think it was his father. It also happens to be the Queen's. -So I like that one. -And I like the woodblock print. You don't have to do me a special price on the woodblock print. -I'm very happy to pay your ticket price. -But could I get a price on the shield? -What have we got on that? I think... What have we got? We've got £40. -What price did you have in mind? -See if we can meet in the middle. Oh, if you're going to meet in the middle, 20 quid. 25, you've got yourself a deal, Sonia. I am very pleased with my Queen's shield. -You'll have to find a sword now to go with it. Not spending big, is he? The decorative shield for £25 and the woodblock print for ten. Charlie is also in Northampton. Our man is having a look around The Old Bakehouse Antiques. -What a wonderful establishment you've got. -Did you ever see Doctor Who out the front? -Oh, he is in there. -He is in the record room. That's a wonderful thing! Where did you get that from? -He's popping in all the time. There are over 60 dealers here. Blimey, he's like a dog let off the lead. Look at that old projector. "Wood box and accessories. Bulb not working." Well, you can get a bulb these days for something like that. the British company Specto were renowned for their cine projectors. captured by British aircraft flying over occupied Europe. I'm not going to spend £110 on that. But I would buy it at a price. Oh, what is that you've found? A vintage bamboo child's push chair. It's got two little wheels at the front here, just to stabilise it. The bamboo's in good condition. It is a really unusual object. And I'm always looking for something quirky and unusual. I don't think that's untoward. That is as charming and historically interesting as that projector. Projector, seat, what have I got? £106.76. -I hope Steve is a nice bloke. Let's leave Charlie to ruminate over the lightness of his purse. 15 miles away in the village of Harrington. He's visiting Harrington Aviation Museum. to build this airfield and set up clandestine warfare operations. James is meeting with the museum's chairman, Clive Bassett. who would become known as the Resistance. The codename for the covert missions was Operation Carpetbagger. This codename, what did Carpetbaggers do? supplies and agents over to occupied Europe. And the Americans initially were using British aircraft. slightly compromised in some of their own missions. They wanted to run them themselves. -why we are here at Harrington. with items such as weaponry and food. without any local knowledge. They may have a contact to make. But that was very dangerous. and would land with some rather unusual supplies. in a special container made for it. push it along, hop on and off you go. -in the moonlight period with some strange person on it. Especially a strange bike, yeah. Very much so. So they sort of abandoned the idea. But the bikes continued to be made. This is the actual size of the bike used. -It is a fabulous piece of design, isn't it? Obviously, the saddle raises up, the handlebars raise up. You can get on this within a minute or so of landing on the ground. the clandestine units were designed to operate behind enemy lines. It ran from 1944 until the end of the war. of three men from Britain, France and America. and help supply, arm and train them. Brit Harry Verlander was one of the agents. Harry Verlander was a Jedburgh wireless operator. and bits of memorabilia from his wartime service. but one story demonstrated his particular style of ingenuity. when he was going to be taken by some Germans. of a tree, it will stop dogs from finding you or chasing you. and the Germans missed him. -So he was... Yeah. Clearly, it worked cos he wasn't captured. -A very brave man. As they all were. Just shows you what training do. I'm amazed how successful they were. involved in resistance groups helped ensure victory for the Allies. I go away a wiser and humbler man. -It was a pleasure to meet you, James. let's see how Charlie is getting on in The Old Bakehouse Antiques. That's up as Beswick model there, Toby jug of Churchill. And it's got one of his great speeches on the scroll here. "in the fields, in the streets and on the hills. in order to get it onto their scroll. a lot of commemorative and advertising wares like this one. The price tag on the jug is £60. unrealistically priced. Not a bad likeness. You could not mistake that for Churchill. There he is, the great man. ..more or less worth the money. I've seen a projector. I've seen that, I think, fabulous child's bamboo push chair. The sum total of these objects is comfortably over £200. I've got £106.76 in total. There is no need to fib to Steve. You just never know in life. Time to strike a deal. Where is Steve? Well, I think you've got a fantastic mix here. I've got three things I've completely fallen in love with. -There is a projector upstairs with its original box. There is a real talking point, which is that bamboo push chair. I like those three things. but I'll tell you what I've got. I've got £106.76. I can't add to it because that's all I've got. -It depends on what these things have cost. -Do you think you could? The projector's sat around for a while, so I'd like to get it gone. -You know, cos you're only taking dust. You take the dust with you, don't you? Would you take all I've got for those three? Are you sure? No, I'll just phone the police. "I've just been robbed." -You are the best dealer I've ever met in my life! -Shake me by the hand. You sure? Yeah, let me have it, please. and Churchill jug for £36.76. and big discounts wraps up our shopping trip. the Edwardian push chair and the Beswick Churchill jug. His purse is empty. £148.76 gone! and the 1920s woodblock print. and has been very thrifty, spending a total of just £75. But what do they think of one another's buys? A ghastly vase for £10. OK, the plate has gone. There is very little silvering. So you've got a sort of calcified piece of glass there. because he's been so stingy! Would I swap my lots for his? No. 'We shall fight in the shops! Bourne End Auctions is where we're headed. We're here. Bourne End Auction Rooms. -Because this is when it turned round. This is where your frugal behaviour comes back to bite you. Taking to the rostrum today is auctioneer Simon Brown. What does he think of the gaggle of goodies from James and Charlie? The 1920s block print, I think you might struggle with that. The 1950s projector, I think, will be the winner today. I can see that making 80 to 120. All quiet then, the auction is about to begin. First to go is Charlie with his leather valise. Start me at £30, please, for this lot. -20 then to start. 20, anybody interested? Ten to start. Ten I'm bid. Got you at ten. Never mind the lady, Charlie. -Are we all done at ten on my left? That buyer has got a great deal there. -Estimate - 40 to 60. James's West German vase is next. £10. Ten I'm bid. Yours at ten. -Bingo, you are already in at ten. 16. 18. 20. 20. 22. 25. 22 on my right. Selling at 22. Are we all done at 22? Got you at 22 on my right now. All smiles for James as he starts off with a profit. It is Charlie's rosewood mirror next. Start me at £30, please, for this lot. 30. Anybody interested at 30? Nobody interested at 30? 20 then start. 20, anybody interested? Nobody interested? No? What do you mean "moving on"? Uh-oh. This no sale means it will be added into your next leg's auction. -Do you think he might not sell any of my items? It's James's tribal stool next. Who will start me at 20, please, for this lot? 20 I'm bid. 22. 25. 27. 30. 32. 35. 37. 40. 42. 45. 47. 50. 55. 60. 65. 60 in the corner. Selling at 60. Yours at 60. Are we all done at 60? On my right. Selling at 60 now. Absolutely. Thank the good people of Bourne. Well done, James, another great outfit. James is in the lead. Can Charlie ramp up his profits with the cine projector? Who will start me at £30, please, for this? -30 I'm bid. Yours at 30. -Are we all done at 30? Maiden bid. Selling at 30 on my left. Yours at 30. With William, are we all done at £30 now? Marvellous, that's only a small loss there. At least you got a bid on that. Yeah, but not a profit. Maybe blowing the whole budget was a bit hasty. Don't dwell on the figures, Charlie. I've got to because I've got to go shopping again, Bingo. And at this rate, I won't even be able to buy a West German vase. -I spent all my money! James's turn now with the big decorative shield. Who will start me at £50, please, for this lot? 40 then to start. 40 anybody interested? 40 I'm bid. With Martin at 40. Yours at 40. 42. 45. 45 with Martin. Selling at 45. Are we all done at 45? Got you at 45 on my left now. So far, James is enjoying profits on every item. Profit, loss. Profit, not even a bid. Are we setting a trend here now? For your sake, Charlie, let's hope not. It's your Edwardian push chair next. Who will start me at £50, please, for this lot? Interesting lot at 50. Anybody interested? 40 then to start. 40, nobody interested? 40 I'm bid. Selling at 40. Yours at 40. 42. Selling at 42. Are we all done at 42? On my left now, got you at 42. A profit, hurrah! But sadly, not enough to catch up with James. -Keep the hanky in reserve. Well, that goes into the kitty. It's James's last item of the day - a woodblock print. Who will start me at £20, please, for this lot? 20, anybody interested? At 20. Ten then to start. £10. Ten I'm bid. Selling at ten. Maiden bid, got you at ten. Selling at £10 just in front now. First loss of the day, though, for you, James. And you are still way ahead of Charlie. -'We shall fight them on the beaches. Enough of the Churchill impressions! "I have four commission bids." -"And I'm going to start at 320." 100, I'm bid. 110. 120. 180 standing. Selling at 180. Are we all done at 180? Unbelievable! Saved by Winston at the 11th hour, Charlie. Has Charlie done enough to get back into the game? James started the third leg with £433.50. of £37.34 after auction house costs. James has a total of £470.84 for the next leg. Charlie began this leg with £148.76. Charlie wins this leg with a profit of £66.08 after costs. He now has £214.84 to take forwards. ..while James offers household tips. -a dusting nightmare, isn't it?